The most common and cost effective hardscape surface is concrete. Concrete has come a long way as it can now be “dressed up” with color, stains, textures, stamp patterns, and overlays. I typically tell clients I can guarantee that concrete will always crack sometime in the future. Less costly than concrete is loose gravel (pea gravel) may be best. Another option in a very natural setting is decomposed granite, or “DG”. Once tamped and hardened it is almost like concrete, but you can still dig through it. DG comes in a variety of colors and typically with a stabilizer agent (like a glue) that will keep it all in one place. The one down side to DG is that you might track it indoors on the souls of your shoes, so if you have hardwood floors don’t use it. Other great options are interlocking pavers. 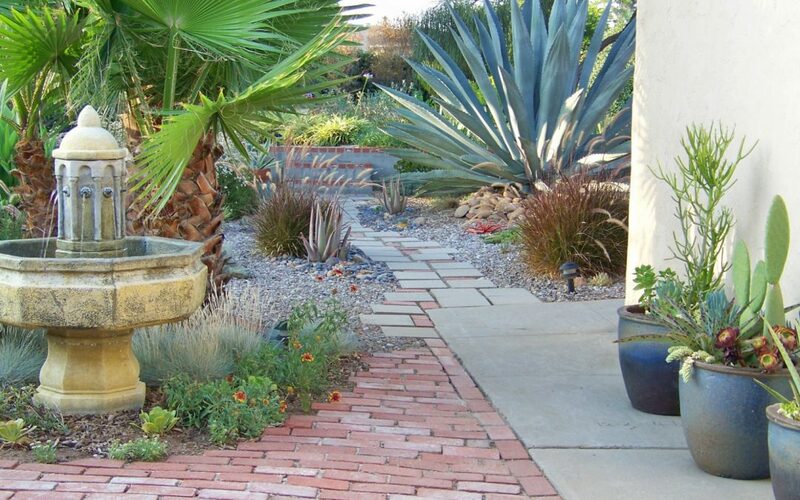 Pavers have become very popular in the past several years. With a more timeless look and a variety of patterns, sizes and colors, pavers have a great appeal. Also pavers will never crack like concrete. If you had a stain or needed to remove a section to repair a utility, pavers can be removed and replaced (unlike concrete saw cuts and patches that never match). Tile, whether quartzite or porcelain also have their use in hardscape applications. Keep in mind using one that has enough of a textured surface so it won’t be slippery when wet (not good near a pool). Flagstone can also be a wonderful look. With so many choices it makes such a beautiful statement using a natural stone material. Having it “dry laid” or using no mortar, it can also be used as a walkway or patio. Beware, however, laying flagstone in cement is one of the most costly options today.